A few weeks ago my husband's cousin welcomed twin girls...perhaps you've seen me gushing all over them on Instagram? Well...I can't stop making stuff for them and today's tutorial is no exception. I needed an excuse to make a growth ruler chart and I finally got not one, but two! 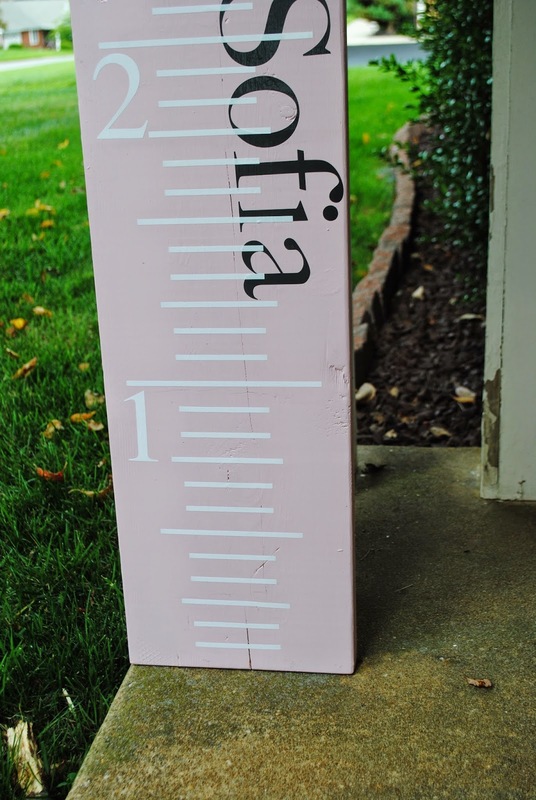 These growth charts are really popular right now and sell for big bucks on Etsy..and I can see why - it's actually a decent amount of work (says the perfectionist in me who had to start over like 4 times). Anyway, I've finally got it figured out and I'm here to share some tricks of the trade. 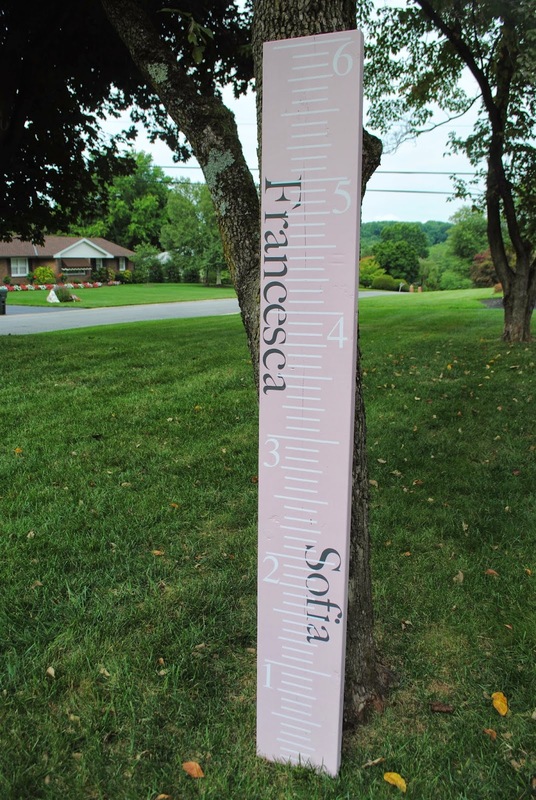 The growth chart ruler I made is a slight variation on the traditional growth charts since I was making it for twins. I wanted each of the girls to be able to be measured on the same chart, but I didn't have enough room to put two sets of ruler markers so...I opted to center the markings down the middle so each of the girls' heights could be marked on 'their' side. Before you even start with your Silhouette, make a detour to your garage or workshop and sand that baby down. Get all the splinters out and make it really smooth. While I was at HD I also picked up a mess up sample jar of pink paint for a whole 50 cents. I think I actually looked at my 3 year old and said "SOLD!!" when I saw what a deal it was and in the perfect shade of pink. Next we painted...and by 'we' I mean me and my 3 year old. He made a mess, I evened it out. We're a good team. I put on two coats covering all the sides and the front...letting the paint dry between each coat. While the paint is drying you can start getting your vinyl design ready. I'm going to share mine here with you for free....BUT you have to promise you'll keep these for personal use only. I've included the 'twins' lines that are centered, and the traditional left aligned ruler marks. 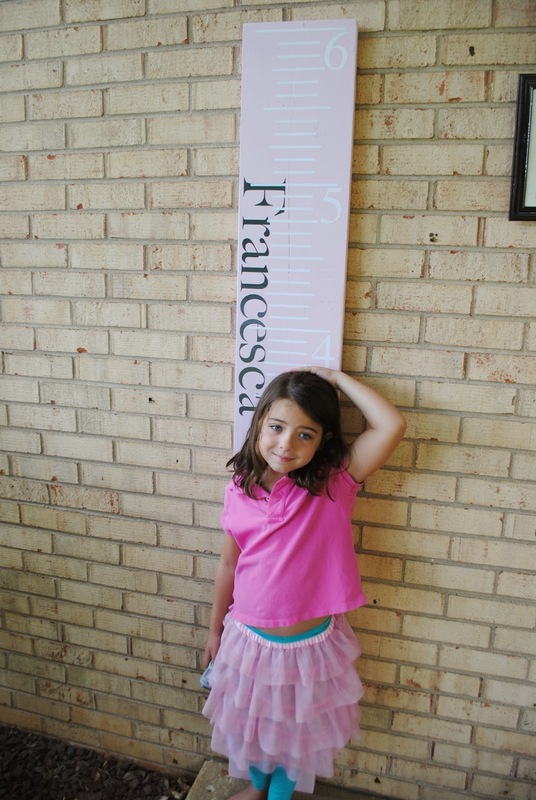 I added the names in gray to my growth chart first so that the ruler lines would layer on top of them. I cut the names on dark grey 651. The 651 (aka permanent adhesive vinyl) has a good stick to it so I didn't need anything to encourage the vinyl to stick to the painted wood. Now for cutting the ruler lines. I have to admit this takes a lot of vinyl...but unless you want to try to line up the lines perfectly straight and perfectly an inch apart, you'll need two yards of vinyl for the 6' growth chart. After you've cut the ruler lines, weed it. I used transfer tape instead of transfer paper because it's easier to see through and I have a 100 yard roll (yes, 100 yards of tape from Expressions Vinyl). In this photo, look closely and you can see the transfer tape is already laying nice and flat on my vinyl and it's ready to be added to the growth chart. Lay your tape or transfer paper down onto of the vinyl design, but don't pull the tape or paper up yet. Instead, you want to use the hinge method detailed here to make sure it's perfectly aligned on your piece of wood. So go ahead and move the vinyl backing with vinyl topped by transfer material onto your piece of wood. You'll notice I started at the 1 inch mark, so position the first vinyl mark an inch up from the bottom of the board. After all of my markings were down, I added the numbers. Most rulers would have the numbers all on the same side, but because this is for twins and I wanted to add their names to each side, I had to split the numbers. I make it sound so easy...meantime this thing actually cost me about 4 yards of white vinyl, a few choice words, and perhaps my first gray hair. 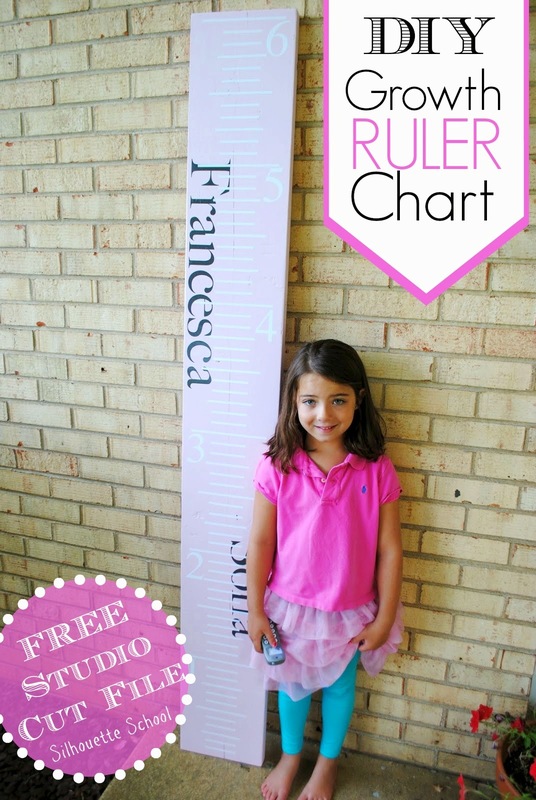 Hopefully, however, you can learn from what I learned in making a DIY growth ruler chart so that yours will go a bit more smoothly.